So far things are very generic. But with debugging it means different hardware, and different hardware connections. And for this connection we need a GDB Server. Eclipse CDT features a GNU Debugger (GDB), and this is what I want to use here: debugging my microcontroller with GDB inside Eclipse. In order to debug the microcontroller, I need two other things: a GDB Server and a Debug Probe. The ‘Debug Probe‘ is a hardware/software able to talk to the microcontroller, e.g. using JTAG, SWD, or using e.g. a serial protocol to talk to a special program on the microcontroller. This Debug Probe stops the target, does single stepping, and in many cases does as well flash programming. Typical examples are the P&E Multilinks, Segger J-Link, or as well the OpenSDA Debug Firmware on the FRDM boards. The ‘GDB Server‘ is a service or program which sits between the GDB inside Eclipse and the Debug Probe. GDB talks to the GDB server using TCP/IP and a port number, so that GDB Server can be either on your host machine, or on a remote machine. 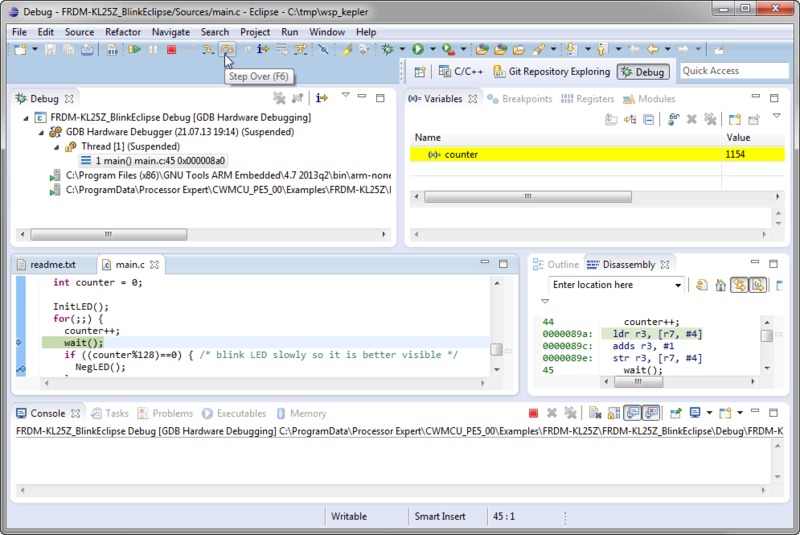 It translates and sends commands from the GDB in Eclipse to the Debug probe, things like setting breakpoints and so on. The communication between the GDB Server and the Debug Probe depends on the probe capabilities. It can be USB, TCP/IP, Serial or anything else. 💡 I’m aware that CodeRed has a GDB server too which works with their OpenSDA implementation (see this post). However, CodeRed has been acquired by NXP back in May 2013, and they will stop support for non-NXP parts. If you want to try it out, the steps below should work with minor modifications too. But the list does not stop here. There are other especially open source implementation of GDB Servers (mbed? USBDM? OpenOCD with CMSIS-DAP?). I wanted to show in this post OpenOCD, but run into some setup problems. So I plan to cover OpenOCD in one of the next tutorials. 💡 If you are not using Kepler, then you will need to change the URL to point to the update site of the Eclipse release you are using. 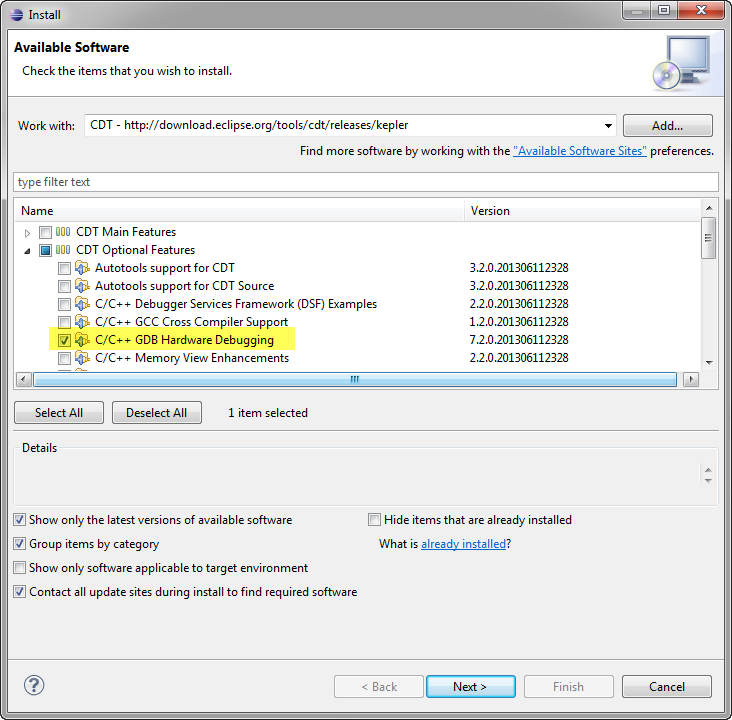 The rest is trivial: click next and through the details of installing the software. At the end, restart Eclipse. ❗ After publication of this article, P&E has released a new Eclipse plugin which includes a much better intergration and includes as well the GDB server (free of charge). 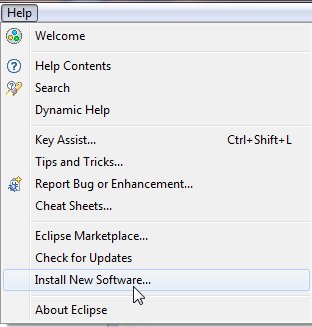 So instead following the steps below, please have a look at P&E Eclipse Update Site for GNU ARM Eclipse Plugins. 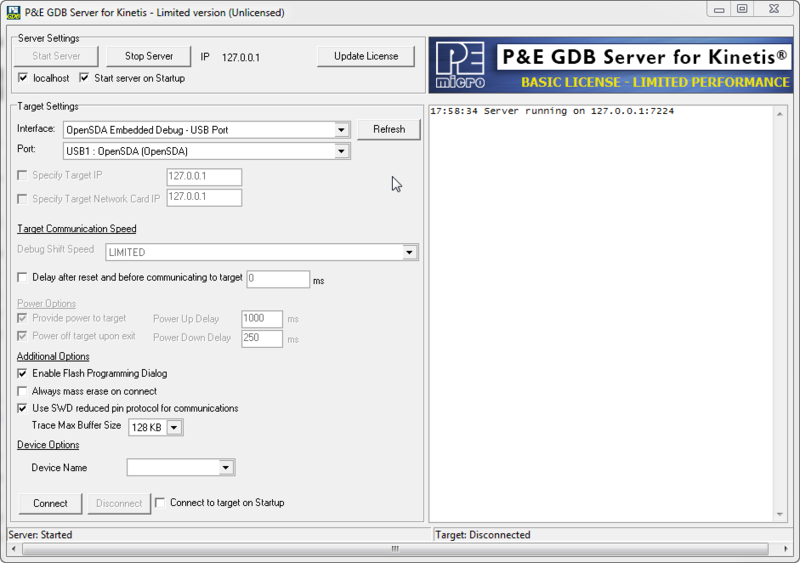 P&E offers a GDB server for Kinetis devices. There is free (basic, limited) version available, and an unlimited (paid) one. Works for all P&E run control devices (Multilinks, including P&E OpenSDA on the Freedom and Tower boards. Free (limited speed and code size) version available. Not clear what the code size limit really is (one information says ‘half of the flash size’, and in the software itself I see ’64 KByte’ (although I’m using a 128 KByte KL25Z, so that might be the same). Used with the P&E OpenSDA, it supports USB CDC virtual COM communication. Slow stepping and code size limitation in free version. Download and install the software from here. Make sure your target and debug connection has power.The FRDM-KL25Z needs to run the P&E OpenSDA Debug Application. 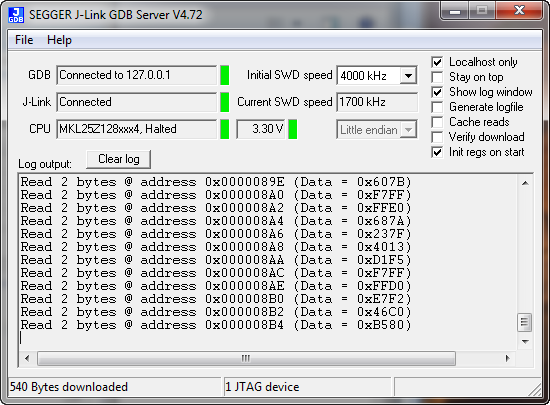 Segger offers a GDB server for their J-Link debugging units on http://www.segger.com/jlink-gdb-server.html. Support for all Segger J-Link run control devices. 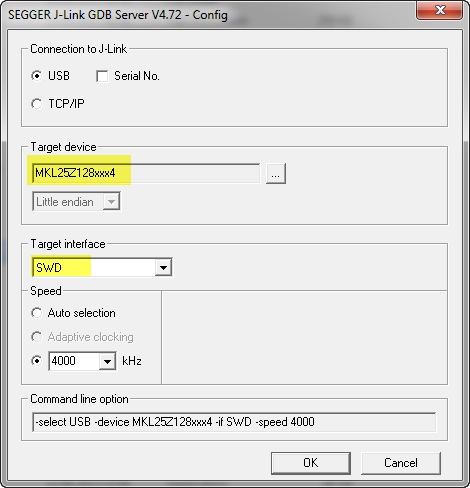 Segger has an OpenSDA J-Link Lite implementation for the FRDM-KL25Z. Fast stepping and no code size limitation. GUI and command line version for Windows. Linux and Mac support (command line version only). No USB CDC with the FRDM-KL25Z board with the Segger OpenSDA firmware. Using it with Segger OpenSDA is subject of restrictions. 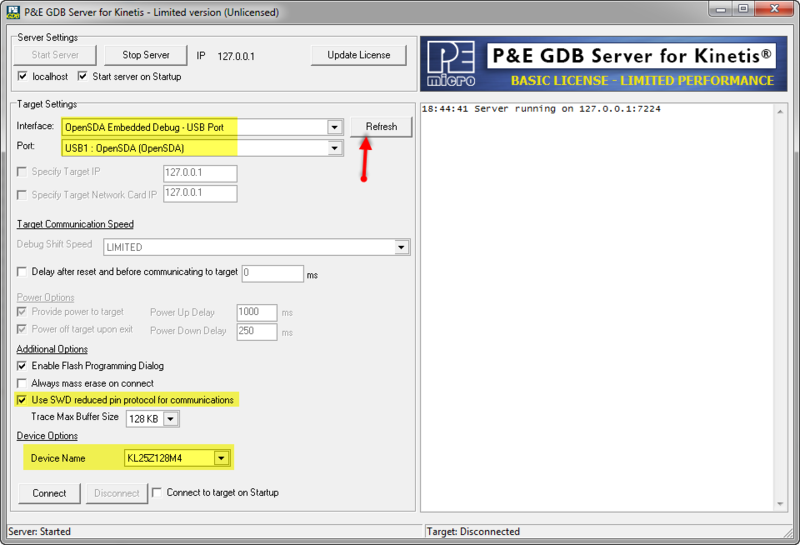 Download the Segger GDB Server from here. Make sure your FRDM board has the Segger J-Link OpenSDA debug firmware loaded. which will start execution of the target. 💡 Use the GDB Server manual/reference to find out which other commands are supported. In order to debug my microcontroller with GDB, I need a GDB server which works for my debug probe or debug connection. For the FRDM-KL25Z I can use the P&E GDB Server or the Segger GDB Server. The P&E one is free in a limited version only (limited code size, slower speed), while the Segger one is faster and unlimited, but does not offer USB CDC. And I need to find out what it takes to have OpenOCD working too. Maybe somebody has written a tutorial about this already? This entry was posted in Debugging, Eclipse, Embedded, Kinetis, KL25Z Freedom Board, Tips & Tricks and tagged Debugging, Eclipse, Flashing, freedom board, KL25Z Freedom Board, open source projects, software, software project, technology, Tips&Tricks, tool chains by Erich Styger. Bookmark the permalink. Thank you again for the tutorial. Unfortunatelly my week is bussy (developping electronics) and i have only time to look on this in detail except at the weekend, so I cannot provide instand feedback. Sorry. I would prefer an fully open debugging tool. Unfortunatelly, I do not know how a solution. So I am very glad that you provide here a good learning resource. good to hear that things are useful, thanks! About your request: if you talk as well about open source USB libraries, then things get little complicated. The only good open source stack I know is the LUFA written by Dean Camera (http://www.fourwalledcubicle.com/LUFA.php). NXP has ported it for their devices. What I would need are volunteers who are willing to spend time and ressources in a joint project to port it to the Freescale USB. Anyone? I’ve been working on a free software USB stack for use with the MC HCK. I’d love to get feedback. Look at the sources at . They are part of the MC HCK project, . congratulations for your MC HCK project! Did you wanted to provide a link in your comment? I’m aware of the LUFA (http://www.fourwalledcubicle.com/) project, so maybe your project is based on this one, or is it differnt? I’ve been working on a free software USB stack for use with the MC HCK. I’d love to get feedback. Look at the sources at https://github.com/mchck/mchck/tree/master/toolchain/lib/usb . They are part of the MC HCK project, http://mchck.org . All sources for the MC HCK are written from scratch, with good software and operating system design principles in mind. In my experience, LUFA was awkward to use, both for defining descriptors and for sending and receiving data. Thanks for that link. I have not used LUFA actively, and I have not found it that awkward. I value the broad LUFA usage, and the many USB classes it supports. Starting things from scratch is always a good learning experience too. But where I see a problem is that this USB stack is using GPLv3, without an exception in section 7. Unlike LUFA, this will not allow to combine your stack with non-GPL code as a ‘combined’ work. So is this very strict GPLv3 version intentional, or can it be changed to a LGPLv3 one? I have not made my mind up yet. Probably it would get more use as LGPL. At least for myself I would not be able to use it if it would be GPL (and not LGPL): it is not feasible to use (and learn/maintain) two USB stacks, one for the open projects and one for the research or development projects which are not going to be released to the public for multiple reasons. So a permissible license would definitely make usage and adoption of the stack more popular. GPL and LGPL only require you to provide access to the source code to your licensees, i.e. entities who you provide with (products with) your compiled code. If you never give the binary to somebody, you do not have to share your code. But that’s exactly the reason for using GPL or LGPL: Users need to have access to the sources, or they will not be able to customize it. Yes, both GPL and LGPL requires access to the source code covered by it (say the USB stack). That’s not the problem. The problem is with ‘combined’ work. If you link/combine GPL code with non-GPL code, then the no GPL part gets ‘infected’ by the GPL. Say I would use your stack, and using customer (non-GPL) code/library. In order to make this work, the GPL license nees to have an exception in section 7 of your GPLv3 licensing terms. Hi Erich, this is just awesome tutorial. I am now facing a problem with semihosting using Segger GDB Server. The GDB server crashes every time printf() to semihosting console is performed. I use GDB initialization commands as in your example, I just added line which enables semihosting (monitor semihosting enable). Do you have any experience with GDB server and semihosting? It would be a great upgrade of your awesome tutorial. I’m not using semi-hosting at all, for many good reasons, and your case is just yet another one :-(. So I’m sorry, I cannot help on this one. There were some bugs related to semihosting in the SEGGER GDB Server, fixed in recent versions. Semihosting trace messages can be routed over the stdout or the dedicated debug channel. The first one is a line buffered device, meaning it displays messages when the ‘\n’ is encountered. If you want to display a partial string (for example ‘Connecting…’ and after a while ‘done’), you just need to insert a fflush(stdout) to make the first part visible. It works pretty well. Another advice is to issue trace messages only on the Debug version of the application, since trying to write on the semihosting channel without the debugger connected and running is not silently ignored, but usually halts the application. 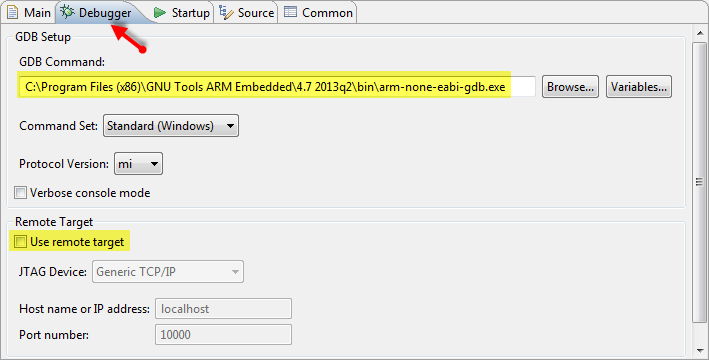 A much better solution (for ARM cores that support it) is to use the ITM/SWO debug channel. It is really fast, it does not hang when the debugger is not connected (Release configurations) and over this channel can be obtained more useful information, like watching data changes, watching interrupts enter/exits, etc. My advice is to retry using semihosting with the new J-Link GDB server. 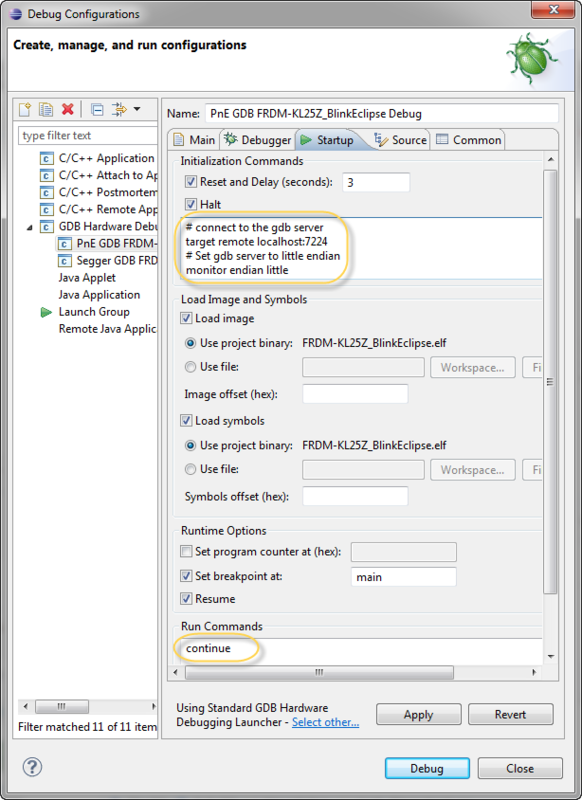 If you need to see an working example, all the STM32Fx applications generated by the GNU ARM Eclipse Templates have functional debugging support and, even if you do not use STM32 processors, the code still can be useful. yes, I have seen this, but not able to try it out. Let us know of the outcome. Not sure, but is there a USBDM port for Mac OS X? HI! Just one small question do you know how to add an easy way to restart the debug section with a simple button? then there is no error. I need to update my post on this, so thanks for pointing this out. I was able to follow these instructions to configure Kepler to hardware debug the KL25Z with the gdbserver included with CoFlash (from the CooCox folks) using the CMSIS-DAP firmware on the KL25Z. 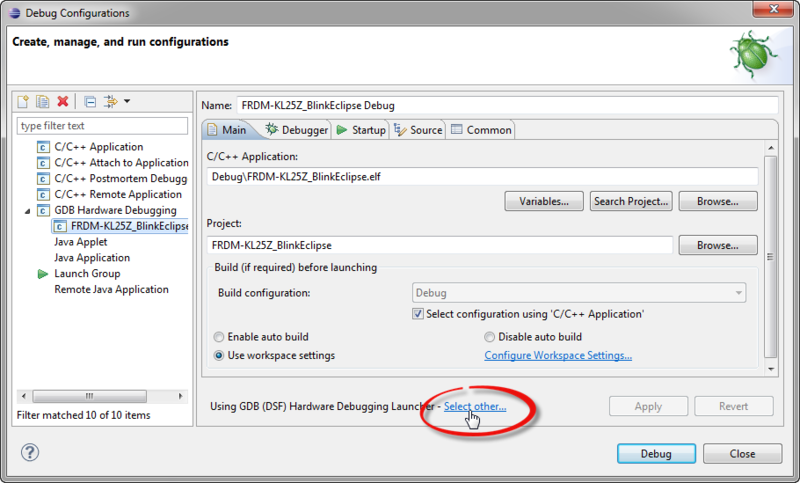 It works, but the experience isn’t the most desirable because flashing the program and some basic debug functions aren’t integrated into the Eclipse GUI. A basic function that is missing is the ability to reset the MCU from the GUI — probably the same restart feature MAT asks about above. Is there an easy way to add such things? Or does one have to hack the CDT and GDB Hardware plug-in classes to enable such features? I’m interested in the gdbserver with CoFlash because it’s one of the only free solutions I’ve found that can talk to some Nuvoton NuVoice chips I’m working with via the proprietary Nu-Link debug adapter. With some coaxing, I can get CooCox to support the NuVoice chips (it isn’t built in), but I would really like to move towards more open and free tools and away from the $3K Keil solution. Yes, that’s the downside of these open and free solutions that they seem to handle the debugging poorly. I was looking into the reset and restart thing, and indeed GDB seems not to support this, and this was a surprise to me. Restart (re-downloading the program) is not a big deal to me, as not used very often, and this can be easily emulated with stopping the debug session and then debug again. But not having reset is a big hole in my view. There are two aspects of reset: performing a reset with the reset pin (hardware reset) would need support through the run control unit (e.g. OpenSDA), as this involves toggling the hardware reset pin. What is used most is a ‘software reset’, and this should be easily possible: setting the program counter to the start address of the application. All what I have found for this are GDB scripts/commands to do this. Thinks like ‘monitor reset’ (if supported), see http://embdev.net/topic/129593. I looked at the CDT source code thinking it couldn’t be too hard to add additional GDB commands to the user interface. That was a mistake on my part. It’s scores of Java classes that look nearly indecipherable to me. I would like to add a button similar to the “step in” and “step over” buttons, but with the “monitor reset” command. I’ll take another stab as it must be possible. I would have thought that whomever added the “GDB Hardware Debugging” functionality to CDT would have added some of these conveniences to the UI. I wonder why they weren’t added? Tested and verified. Good tutorial anyway. I would rather to debug it in gdb terminal and cross-checking with list files. I am going to use it to test my C++ demo on KL25Z. Currently, GCC built successful, but LED doesn’t blink. So I do need a debugger to find out why, maybe something wrong with heap? yes, I miss the reset functionality too. Breakpoints are easily set with double clicking on the column left to the source line. Variables are shown in the ‘Variables’ view. 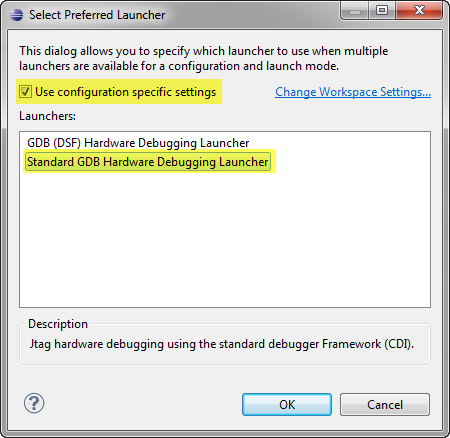 I noticed you explicitly selected ‘Standard GDB Hardware Debugging Launcher’. Please note that the current debugging configuration supported by CDT is based on the DSF infrastructure, and the ‘Standard’ one will probably be marked as deprecated. My advice is to give DSF a try, I guess it should work for your configurations too. My J-Link plug-in is based on DSF and it seems ok on all available platforms. At the time of writing of this article, DSF did not work for me. I’ll give it a try. I couldn’t get the Activation widget to work, had to call them and found out you must open the GDB server from C:\PEMicro\gdb_server_kinetis\PEGDB\pe_gdb_server.exe – just clicking the program in the Start menu will not work, when you paste the activation code nothing happens. You mean to active the P&E GDB server? I think I had not to enter any activation code for the free/limited version. Otherwise this might be a question for P&E? Yes, ‘Standard’ is the same as ‘legacy’. They changed that naming in later plugins, probaly just to create more confusion ;-). Seriously, the DSF is the ‘new’ way, so the labeled the ‘old’ one as ‘legacy’. I have bought the TWR-K20D72M evaluation board. An on-board debug circuit (OSJTAG) has been implemented. Have you any idea, how can debug/program with this OSJTAG interface on this DIY Kinetis Tool Chain? If I remember correctly, the OSJTAG runs an P&E implementation, so you can connect to it with the P&E connection. I’ll try the P&E connection as soon as i receive the evaluation board. It could be take a lot of time.